THE proliferation of smart phones with high-quality digital video recorders has led to an exponential growth in the amount of live footage being uploaded to social media channels such as YouTube and Instagram. In a breaking news story scenario, it is now a member of the general public who is most likely to capture the first footage. Yet can we trust these videos? Does the uploader have an agenda? Is this only part of the story? As journalists we should alway be cautious of any user-generated content (UGC) that we receive. With terrorist groups using video as an effective propaganda tool – and with sophisticated and easy-to-use visual effects and editing tools available just as readily as the recorders themselves – journalists can’t always trust what they see. Like every other source, we have to be able to verify that, that source is genuine and that their information can be trusted. This can be difficult in a fast-paced, breaking news environment, especially if the news event is on the other side of the globe. Based upon my own experience and material that I’ve read over the years, I have compiled some guidelines for journalists. There are many other, great guidelines out there. I have based mine along the best-practice of organisations such as Ireland’s Storyful, who are at the forefront in shaping verification techniques for journalists in the digital age, and who adopt what they call “a Lynn Barber approach” to the content they receive. That is they question it, scrutinise it and force it to win them over. This is the first step to make sure that you have the video in the event that the user later takes it down. Downloading and saving videos from YouTube for preservation is easy. There is a great short tutorial here to help you, using the 4K Video Downloader software. The key goal in verifying any video on YouTube – just like any other piece of information – is to get to the original source and to speak with them about the footage. The video that you first come across may not be the original or from the original uploader. You need to find the original uploader who will most likely have taken the footage and is the closest to it. So how do you know if the video you have is or is not the original? There are a number of ways of finding out and various investigative tricks you can employ for quick verification online. Firstly, you should work off the assumption that the video you have has been duplicated from the original source. This is often also called ‘scraped’ content, ie: lifted from elsewhere. So your search should begin on YouTube by looking for earlier versions, if there are any. Your video will most likely have some piece of text used to identify it within YouTube’s search engine. This will usually be a description or a tag, a place name or something pointing to a location – ‘explosion at church in north Baghdad’, etc. Gather together useful keywords from this information to begin your search. If the description is in a foreign language, copy and paste the text into Google Translate. You can then extract these keywords and search them. Using YouTube’s search engine, use these keywords to look for earlier videos and order the results using the date filter. This is within the Filters menu, which is directly below the search bar (see image above). Select Upload Date and scroll through the results to see if any of the video thumbnails are a match for yours. Even if the video is scraped, it is likely to have the same thumbnail image as the original. 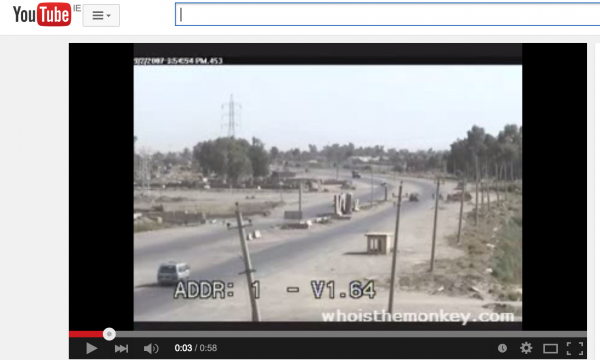 Another method to find the earliest version of a video is to perform a “reverse image search” of the video thumbnail. You can do this using Google Image Search (when you first get your search results, use the search tools to filter by date) or TinEye. I recommend TinEye. By doing this, it can help you identify the first time a video thumbnail or image was used. Use the YouTube Data Viewer to extract the thumbnails you need. The viewer also can be helpful in extracting the exact time a video was uploaded, further placing it’s time, etc. Here is a step-by-step guide on how to do a ‘reverse image search’. As you shall see, it’s fairly straightforward. These tools should help bring you to the original uploader or source of the footage, and take you on the first step to verification. Once you’ve found the original source, you will have already began to amass some information about them, such as their YouTube handle, the date they registered, the type of videos they upload, and possibly links to external accounts and their location. Having their handle and account details will allow you to contact them immediately as most video sites allow you the option to click on the uploader’s name and message them. As mentioned above, their account also allows you to examine them in some detail and do some of the usual journalistic checks you might do in verifying the source. Like every other user or uploader, they will have left a digital footprint behind them, and this is gold in gathering some information about who they are. These details can help you begin to determine how trustworthy a source they may be. What type of content does this uploader usually post? Do they lift – or ‘scrape’ – content from other sources? What location are they usually posting from? Does this match the location they are registered in? What do the video descriptions say about them? Who is commenting on the videos? Will these comments help draw you to the source? You can also venture further into the internet to pull together a picture of your source as you await their response. Most people tend to use the same handle across their various social media accounts. Take their handle and Google it – what do you get back? Use the unique video code to find the user on Facebook and Twitter where they will almost certainly have shared it at some stage. Every piece of video has a unique code that appears in the URL. On YouTube and Facebook – as well as other platforms – the code is placed between “v=” and the next “&” in the URL. Check their profile to see if they link to a website or email? If you find their social accounts, does this information correspond in terms of their location and reliability? For instance if an uploader is regularly posting videos purporting to come from Iraq – but their Twitter places them in London – this will raise alarms. Are they active on their various accounts? If they have a website they list, can we use WhoIs – https://who.is/ – to get their name and contact details? Once you have a name and a location, can you get a phone number through the usual phone directories or LinkedIn? By going through this question and answer process of kicking around all you know about your source, you will very quickly begin to develop an idea as to whether they are reliable and you are on to something good. You will also, most likely, be able to get a contact fairly quickly. You need to speak with the source. There really is no substitute for talking to them. When you do speak to them you can also ask them about things you’ve spotted to see how they respond. If their answers don’t match up, thread carefully with the content. When talking to the source, ask them some questions about the footage. Again their responses will immediately help you authenticate weather the video is real. Ask them what they recorded on; what did they see; where were they standing; what was the weather like; what does the video show; etc. By verifying the original source, you will also be able to get permission to use the footage, should you wish to proceed. So you have managed to find the original uploader of the content, spoken to them and are satisfied that they took the footage and uploaded it. But is it what it purports to be? Was it taken on the day that the source said it was? On occasion, this will be easy to verify. If you know the location well, you will likely be able to tell immediately if the video is as it suggests. However, if the footage is of a location you are unfamiliar with, verifying the location can be a little trickier. Again, the start point will be your original video. If you have spoken to the source and they have given you address details, put them into Google Maps and use Streetview or Google Earth. Does the result correspond with what you are seeing in the video? If you have not yet managed to speak to the source, go to the text that they have provided in the YouTube description or the name. If the text is in a foreign language, enter it into Google Translate and identify the place name. Beware though that Google Translate often mistranslates, so it can be worth Googling the translation and the original language version of the word. If you have the vague location – ie: a city or town name – you will be looking for clues in the video – buildings, distinctive geographical marks – to help pinpoint it’s location on Google Maps or other satellite view, such as Wikimapia. Are there mountains in the background or church buildings? A spire perhaps, or business names that you could Google. Are there street signs to give you an exact location? It can be useful here to build a panoramic image to match against a satellite image. This can be build easily and quickly and there is a step-by-step guide to building a panoramic image from a video here. Once you have this, you can cross reference landmarks against Google Maps to locate the spot shown in the video and verify the location as Christoph Koettl has done below. So you’ve confirmed the location, but was the video taken on the date in question. This is generally straightforward for an event such as a planned protest or demonstration, or other calendar events. You’ll more than likely be able to corroborate your footage against other pictures from reputable news organisations, as well as other User-Generated Content on social media platforms. For more obscure videos, the date can be hard to verify. If the video has been uploaded via YouTube, you’ll have a timestamp, but beware that these videos are time-stamped in Pacific Standard Time at the time of upload and could be out by a day or two. So if you upload in Ireland at 1am on May 2, this could be stamped as 5pm on May 1 on YouTube. You are best to take the video URL into the YouTube Data Viewer to strip the exact time of upload, and then use a time and date converter to get the correct location time. Weather reports could also prove helpful. Wolfram Alpha can be used to provide weather information about a place on a particular date, so if its raining in your video you can check if it was actually raining in a particular location on a particular date. When you have all the above information tallied together and rinsed through, you are at the final stage of verification. Ask yourself; given all I’ve examined and found out, does the video make sense? Is there anything here that is setting off my journalistic alarm bells? Remember, you are operating from the assumption that the video is false, so does the evidence and information that you’ve dug up refute this for you? Going through the above process might not always cover you. The easy availability of editing software and effects mean that an elaborate hoax, such as this or this, is increasingly common, however there are always flaws to assist you in debunking them. You can use software – such as the VLC editor used to create the panoramic image described earlier – to break a video down to individual scenes and further examine. Vietnam re-up – A month of pure fun!